This Saturday marked the second time in two weeks my newspaper’s been stolen from the front steps of our house. Trivial? Sure. Infuriating? Sure. Both times, the crimes have been caught on our surveillance camera, and from the fuzzy images it appears as if the same perpetrator has been involved. 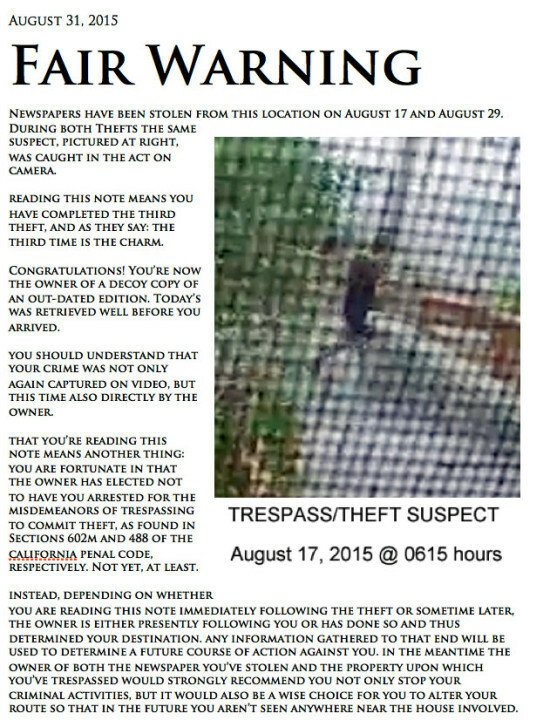 This entry was posted on Sunday, August 30th, 2015 at 6:14 pm and is filed under crime. You can follow any responses to this entry through the RSS 2.0 feed. Both comments and pings are currently closed.